Sunny. High 68F. Winds WNW at 10 to 20 mph.. Some clouds early will give way to generally clear conditions overnight. Low 48F. Winds WSW at 10 to 20 mph. KURT WILSON/The Missoulian A former meat market built in 1910, the Montana Valley Bookstore in Alberton is the centerpiece of the town's main street. The store features more than 100,000 books and will celebrate its 25th anniversary in March. ALBERTON - Every once in a while - like lately - a rumor goes around that Keren Wales is closing her Montana Valley Bookstore, home of 100,000 books. But the speculation is always untrue. Wales is looking forward to the store's 25th anniversary in March. She lives in it with her 12-year-old son, Sam, in a cozy apartment at the back. And she's been working in bookstores since she was 8 years old. "I'm not doing anything else," the 44-year-old Wales said recently in an interview at the Railroad Avenue store in Alberton. "I love this." Besides, she can't quit, she said. In two enormous containers stored east of the seniors' center downtown, she still has most of the nearly 84,000 pounds of books that came out by truck two years ago from her mother's bookstore in Pennsylvania when her mother retired. That was about 2,500 boxes of books from the Gwynedd Book Store outside Philadelphia. Now they're working their way through the bookstore in Alberton. "I figure 100 boxes a year, I'll be 70," Wales said. From 8 a.m. to 7 p.m., seven days a week, Wales lives the rhythms of the bookstore. Winters are quiet, Wales' chance to catch up on pric-ing, sorting and shelving. Sometimes she rents a movie and half watches while she prices books in her living room with an ear open for the occasional customer. Summers are busy, when 100 people a day might come in, and people will be waiting at the door at 8 a.m.
Every year, it's about 100 boxes of books, in and out. "It's like a tide," she said. "The books come in here and pile up all winter, and they go out all summer. That's my life's mission." The general rule is Wales buys books for one-fourth of the original price, then sells them for one-half. But lots of books are donated, left on the porch sometimes or brought in by people cleaning house. Many of the customers are regulars, but most are not locals. 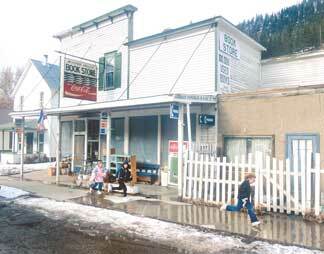 Book collectors make the Montana Valley Bookstore a stop when they're traveling. Truck drivers put the book-store on their maps. One trucker, for instance, a Polish man who's an avid reader, comes through every two months. He brings a sack of books to trade in. Wales puts on the coffee pot. "We'll talk politics, world affairs, and then he's off," she said. Snowbirds come through on their way south in the fall and north in the spring. "Some of them are almost like family," Wales said. "You see them only a couple times a year, and you talk about books, but you talk about your life, too." A perpetual customer is the I've-always-meant-to-come-here type. Lots of people see the "100,000 books" billboard on Interstate 90 or hear about the store from other peo-ple. Ed and Lee Ann Gottfried from St. Ignatius were two of those one day this week. Usually, when they travel west, they cut over to St. Regis on Highway 200. This time, they had to go to Missoula, which sent them right to the Alberton exit. "We've been aware of this forever," Lee Ann said. "This time, we had to stop." Soon, they had a pile of books to buy. "We have to leave," Lee Ann said. "This is getting expensive." Some are unmoved. Take Keith McComb, Wales' egg man, who came in with two boxes for her. "I don't read," he says cheerfully, and doesn't hang around. Wales' life mission was also the life mission of her father, Kenneth Wales, and her mother, Alicia Wales-Goodolf. Kenneth worked as a land surveyor and settled his family in Missoula in 1952 after a hunt-ing trip to Montana. They built a house in Pattee Canyon and bought land in Sawmill Gulch in the Rattlesnake Valley. The first three of the nine Wales kids were born in Missoula. Kenneth's discovery and embrace of Christianity landed the family in Elkins Park, Penn., where he went to Faith Seminary. Combing garage and estate sales for theology books, he brought home boxes full. "Pretty soon, we had 15,000 books in the garage," Keren Wales said. "We couldn't park in the garage anymore." Soon, in 1966, they opened the Gwynedd Valley Bookstore in an eight-bedroom Victorian house that held bookstore and family. In 1973, Kenneth visited Montana to survey the Sawmill Gulch acres thinking he should sell them, and he fell in love with Montana again. Then he discovered Alberton, then a busy railroad town. He started thinking of another bookstore there. But nothing was for sale. He went home. "He prayed about it," Keren said. "He said, 'Lord, either close or open the door.' And the next day, it went for sale." "It" was Bestwick's Market, a 4,500-square-foot butcher shop and meat market built in 1910. The Waleses bought it. For five years, they traveled back and forth, bringing out books, building shelves, organizing. They opened in March 1978, becoming a two-store operation with several thousand miles between the enterprises. Keren Wales doesn't know for certain that she has 100,000 books, but it's around that, she knows. She has kept her dad's organizing system, a very logical method that puts "sports" in "fine arts." "I've had librarians come in here and say, 'This is not the Dewey Decimal System,' " she said. "I say, 'You're right. It's not. But it's close.' "
When Kenneth Wales was murdered in Pennsylvania in January 1981, Keren was the logical one to take over the store. Since then, the building went on the National Register of Historic Places in 1997 - the plaque goes up soon - and she added a customers' restroom, plumbed by Wales herself and located at the east end of the Practical Arts aisle. Wales has raised two sons at the store - Sam has been answering the business phone since he was 4 and works in the store just as Wales and her siblings did for her parents - and lives comfortably with Sam, their three dogs and two cats. Most customers comment on Scarlet, their 22-pound calico cat who often serves as the store's greeter. Come March, the bookstore will celebrate its birthday, but Wales isn't sure how. The store is too full to fit many people in it, and the weather is questionable in March for a reading or a reception on the porch. Maybe a summer event, Wales muses. "I feel like I should do something," she said. "I shouldn't just let it pass. I don't know what yet."